Do you know it all, and just want someone else to take care of it? Or do you need help figuring out what to do? Save yourself a passel of hassle and know what kind of client you are before you call anybody for help. Matched with a company who understands where you are in the Portent Client Matrix will reduce confusion and frustration and encourage achievement of your goals. Two questions: 1. Do you know what needs to be done? We know you want to increase ROI, but do you know how specifically you need that done? Either you need help defining what needs to be done (a general client) or you already have a good idea of what needs to happen (expert). 2. How many resources are you dedicating to this project? Human power, technology, money- are we looking at minimal (just enough for this particular job) or substantial resources? The Full Service client says “Here’s my plan. Let’s compare notes, and then you get started on these projects.” They want a variety of services, and have in-house expertise and the resources to make it happen. The Focused client says “Here are my ROI and brand goals- now go make it happen.” They understand their broad goals and have the resources to back them up, but need more guidance on how to achieve those goals. The Concierge client says “Tell me how to do this particular project.” They want expert help on a specific project, and want to dedicate only as many resources as necessary to do this one thing. The Planning client says “How should I start this? How can I move forward?” They want to understand both what success would look like and how to get there, but because of resource constraints, will likely have to get there on their own. 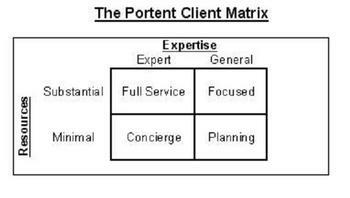 No quadrant is better than another, so long as you (and your agency) understand which part of the Matrix you are in. If you (or your agency) think you are in a different quadrant than you are, or if you and your agency don’t agree on which quadrant you are in, then be prepared for confusion and frustration. See examples from our client list, and why each relationship works. The Full Service client: AmericanStationery.com American Stationery runs 6 sites and sells many kinds of stationery. They have a talented marketing team and realize ROI by assigning to Portent the responsibility of increasing online revenue. Portent accomplishes this through SEO, SEM, email, and site design and development. The client and the agency work together on creating detailed marketing plans for the agency to carry out. The Focused client: LindaKeithCPA.com Linda Keith knows she needs both high-level advice and tactical suggestions to meet her online ROI goals. She asks Portent what it would look like to “make it happen.” She decides to have Portent build a new site, while having her staff handle day-to-day marketing work. Because everyone knew from the start that the client needed explanation of why things are done in a certain way in addition to the details of how they are done, the client gets the support she needs while the project meets her modest needs. The Concierge client: Veoh.com Veoh.com uses Portent Interactive for SEO advice. Veoh has a savvy technical staff that has the time and skill to implement SEO recommendations. All they need are those recommendations on an ongoing basis. Both the client and the agency know each others’ role, so there is harmony in the relationship. The Planning client: Lilipip.com Ksenia is starting Lilipip.com to offer short videos on cell phones that teach children to read and write. She is approaching launch, and looking for general online marketing advice. Portent gives her insight on her audience and how she can reach them. The agency gives the client a helpful push on the way to launch and on she goes. When you consider internet marketing projects this year, think about the resources and the expertise you are dedicating to the project. Classify yourself within the Matrix. Tell people which quadrant you are in when you consider working with them. Make sure they are comfortable and experienced in working with firms in your quadrant.